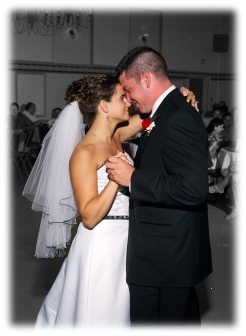 Final Touch Entertainment, North Ridgeville wedding DJ, Ohio disc jockey service, weddings in North Ridgeville, corporate team building, ideas, deejay, disk jockey, Karaoke. Today, Disc Jockeys have become a very popular form of entertainment at all types of events including wedding receptions, community events, festivals, steak fries, graduation parties, class reunions, fund raisers and more. An experienced entertainer will get people dancing, coordinate events, make all announcements, keep the evening moving and create a real party atmosphere. Music is a very important part of any celebration, the right choice in entertainment will enable you to sit back and relax knowing all your guests are having the time of their lives and that the evening is flowing to YOUR specifications. Planning any event can be stressful, however, with the right assistance any event can be the best possible with Final Touch Entertainment. As you navigate our site, you can see all of the different services Final Touch Entertainment performs and assists in the planning and coordination. Let the experience Final Touch Entertainment has gained over the years show you how we can handle each and every event with the utmost professionalism, organization, coordination and performance. Final Touch has coordinated over 1000 wedding receptions, hundreds of corporate events, school dances, hosted Karaoke shows, trivia game shows and music trivia nights more than anyone could possibly count. Final Touch has recently added Texas Hold 'em to our services, and completely operates under all laws and statutes of the State of Ohio including the latest craze in fund raising 'Texas Hold'em Tournaments'. Just looking for sound reinforcement? PA system or need corporate presentation items? Final Touch is a Full Time, Full Service entertainment company. That is, when you call us, we answer the phone! If you do get voice mail, we return calls in the order they are received and usually within 10 minutes so your call will be returned rather than waiting you on hold for what seems like days. Serving Northern Ohio for over 20 years, Final Touch is a full service, full time entertainment and support company. We are fully licensed, bonded and insured. With a $4,000,000.00 aggregate liability policy (Twice the Industry Standard), Final Touch makes sure that we protect our clients as well as ourselves and any venue we visit. At Final Touch, we also have all of your entertainment rental needs. DJ systems, Karaoke Systems, Bounce Houses, Dunk Tanks, Sno-cone machines, Cotton Candy, Popcorn machines and more. If you are in need of any rental item, please, contact us. If we don't have it, we know where you can get it! Contact us today to experience the Difference that Final Touch Entertainment provides for every event! You can Check our Availability by using the Check Your Date box below or by clicking on the contact info button! Select the date of your event. Then click on the check availability button to instantly check for our availability. Akron| Alliance| Amherst | Ashland| Ashtabula | Aurora| Avon| Avon Lake| Bath| Bay Village| Beachwood| Bedford| Bedford Heights| Berea| Boston Heights| Bratenahl | Brecksville| Broadview Heights | Brook Park| Brooklyn| Brooklyn Heights| Brunswick | Canal Fulton | Canfield| Canton| Catawba| Chagrin| Chagrin Falls| Chardon | Cleveland| Cleveland Heights| Clyde| Columbia Station| Copley| Crestline| Cuyahoga Falls| Cuyahoga Heights| Eastlake | Elyria| Euclid| Fairborn| Fairlawn| Fairport Harbor | Fairview Park| Findlay | Fremont | Geneva| Geneva-on-the-Lake | Geona| Grafton | Grand River| Green Springs| Greenwich | Highland| Highland Heights | Highland Hills| Hudson | Huron | Independence| Kelleys Island| Kent| Kipton| Kirkland | LaGrange| Lake| Lakewood| Litchfield| Lodi| Lorain| Lyndhurst | Macedonia| Mansfield| Maple Heights| Marblehead| Mayfield| Mayfield Heights| Medina| Mentor| Mentor-on-the-lake| Middleburg Heights| Milan| Millbury | New London| Newburgh Heights | Niles| North Canton| North Eaton| North Olmsted | North Ridgeville| North Royalton| Northfield | Norwalk| Oak Harbor| Oakwood| Oakwood Village| Oberlin| Olmsted Falls| Orange| Orrville| Orwell| Painesville| Parma| Parma Heights| Paulding | Peninsula| Pepper Pike| Perry| Perrysburg | Perrysville| Port Clinton | Put-In-Bay| Ravenna| Richfield | Richmond Heights| Rittman | Salem| Sandusky| Seven Hills| Seville| Shaker Heights| Sheffield Lake| Sheffield Village| Solon| South Amherst| South Euclid | South Russell| Stow| Strasburg| Streetsboro | Strongsville| Struthers| Swanton| Sylvania | Tiffin| Toledo | Tontogany| Tuscarawas| Twinsburg | University Heights| Valley City| Valley View| Van Wert| Vermilion| Wadsworth| Wakeman| Walton Hills| Warren| Warrensville Heights| Waterville| Wauseon | Wellington| West Salem | Westfield Center| Westlake | Whitehouse| Wickliffe| Williard | Willoughby| Willoughby Hills| Willowick| North Ridgeville wedding DJ, Ohio disc jockey service, weddings in North Ridgeville, corporate team building, karaoke, ideas, deejay, disk jockey, Texas Hold 'em.